A map showing Doggerland, a region of northwest Europe home to Mesolithic people before sea level rose to inundate this area and create the Europe we are familiar with today. At the end of the last ice age, Britain formed the northwest corner of an icy continent. Warming climate exposed a vast continental shelf for humans to inhabit. Further warming and rising seas gradually flooded low-lying lands. Some 8,200 years ago, a catastrophic release of water from a North American glacial lake and a tsunami from a submarine landslide off Norway inundated whatever remained of Doggerland. Things aren’t always what they seem on the surface. Looking at the area between mainland Europe and the eastern coast of Great Britain, you probably wouldn’t guess it had been anything other than a great expanse of ocean water. But roughly 12,000 years ago, as the last major ice age was reaching its end, the area was very different. Instead of the North Sea, the area was a series of gently sloping hills, marshland, heavily wooded valleys, and swampy lagoons: Doggerland. Mesolithic people populated Doggerland. Archaeologists and anthropologists say the Doggerlanders were hunter-gatherers who migrated with the seasons, fishing, hunting, and gathering food such as hazelnuts and berries. Over time, the Doggerlanders were slowly flooded out of their seasonal hunting grounds. Water previously locked away in glaciers and ice sheets began to melt, drowning Doggerland. Around 6,000 years ago, the Mesolithic people were forced onto higher ground in what is today England and the Netherlands. Evidence of Doggerlanders’ nomadic presence can be found embedded in the seafloor, where modern fishermen often find ancient bones and tools that date to about 9,000 years ago. These artifacts brought Doggerland’s submerged history to the attention of British and Dutch archaeologists and paleontologists. Using sophisticated seismic survey data acquired mainly by oil companies drilling in the North Sea, the scientists have been able to reconstruct a digital model of nearly 46,620 square kilometers (18,000 square miles) of what Doggerland looked like before it was flooded. Those studying the Doggerland area are finding that the climate change faced by Mesolithic people is analogous to our own. Mesolithic peoples were forced out of Doggerland by rising water that engulfed their low-lying settlements. Climate scientists say that a similar situation could affect the billions of people who live within 60 kilometers (37 miles) of a shoreline today, if polar ice caps continue to melt at an accelerated pace. The story of the Mesolithic people and their home of Doggerland are cautionary tales for the consequences of a rapidly rising sea level. 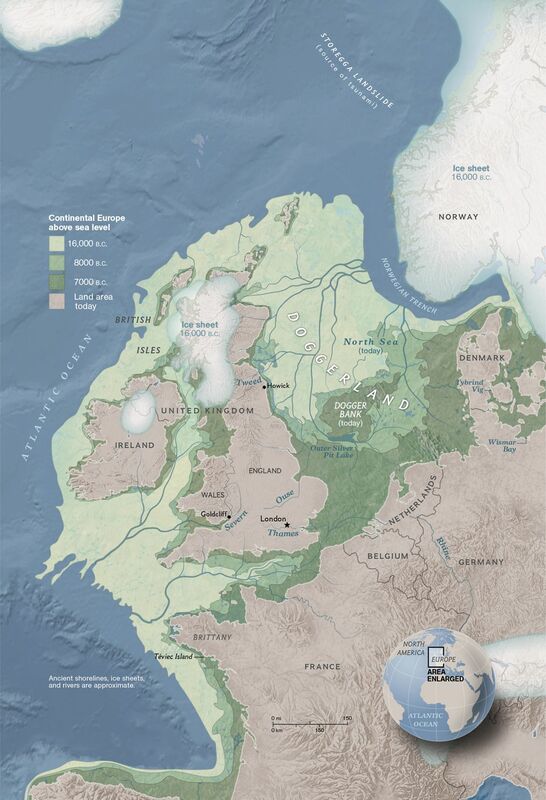 Glacial melt forced the Mesolithic people out of their homes and now Doggerland, like the fabled Atlantis, is just a sunken and mostly forgotten Stone Age culture, its only evidence being decayed artifacts and fossils of its people. Using the map scale bar, what is the approximate distance you would have to travel to get from England to France over water today? Using the scale bar, the approximate distance between England and France over water according to this map is 32 kilometers (20 miles). Answers may vary within a range of 24 kilometers (15 miles). The actual distance is 34 kilometers (21 miles). According to the map key, areas shaded in dark green were not covered by the sea in 7000 BC. How many years ago is that? 7000 BC is 9,012 years ago in 2012 or 9,013 years ago in 2013. How can we know what the landscape of Doggerland looked like thousands of years ago when it is covered by ocean today? Scientists reconstruct the landscape using data collected by seismic surveyors working for oil companies in the North Sea. There is a river flowing near the site labeled Goldcliff on the map. What is the present-day name for the large body of water this river would have flown into 16,000 years ago? The river flowing from the Goldcliff site would have flown into the Atlantic Ocean. Ancient Doggerland included parts of the coastline of what modern-day nations labeled on this map? Ancient Doggerland included the parts of the coastline of modern-day France, Belgium, Denmark, Germany, Netherlands, Norway, Ireland, and the United Kingdom. When Doggerland was being flooded, sea level rise was as much as 1-2 meters (3-6 feet) a century. The seafloor of the North Sea preserved many artifacts of Mesolithic people, including perfect sets of footprints left by the nomadic tribes, some containing up to 39 perfectly preserved prints. Those studying Doggerland say many of the sites where they have found artifacts were located on steep ancient river banks, which the Dutch call De Stekels (the Spines). (16,000-6500 BCE) landmass connecting Great Britain to mainland Europe, drowned by the southern North Sea following the last ice age. person who gets food by using a combination of hunting, fishing, and foraging. long period of cold climate where glaciers cover large parts of the Earth. The last ice age peaked about 20,000 years ago. Also called glacial age. (12,000-3000 BCE) Stone Age time period between the Paleolithic and Neolithic. Also called the Middle Stone Age and Epipaleolithic. image or impression of an object used to represent the object or system. having to do with a way of life lacking permanent settlement. base level for measuring elevations. Sea level is determined by measurements taken over a 19-year cycle. having to do with earthquakes. Read the full text of the story and see photos and art from National Geographic magazine.